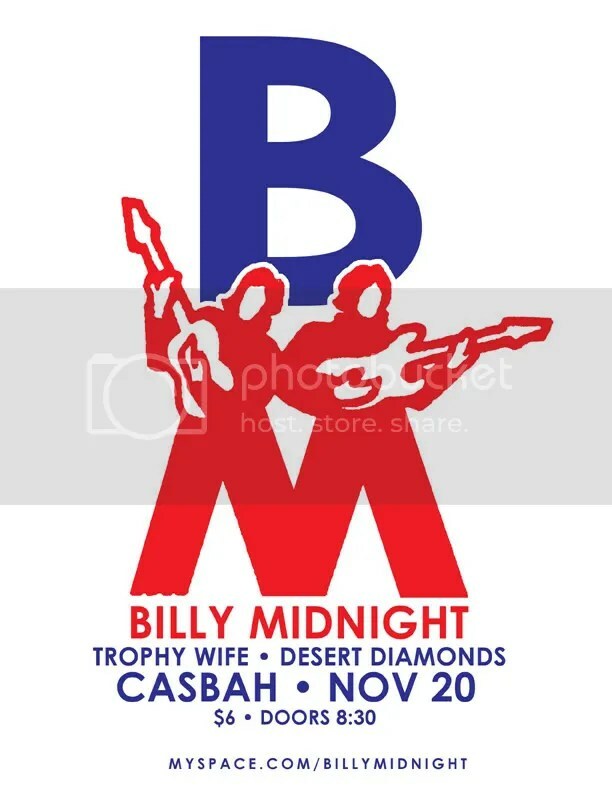 Billy Midnight has been one of my favorite bands for a number of years. My sister introduced me to their music around the time I turned 21. Newly 21 and excited to go to bars I usually ended up at all their shows around town. My favorite concerts have been Billy Midnight shows, from hour long sets at the Casbah or the Belly Up Tavern to, all night, 5 hour sets at dive’s like Kelly’s Pub or the Ould Sod, where the song lengths get longer as the night goes on. My friend Mark and I used to always look forward to the 20+ minute “Sasquatch” jams at 1AM during their divier shows. They stopped playing nearly as much a few years ago, but it looks like they’ve been playing more and more recently. I was really excited to see that they’re playing tonight at the Casbah — although we probably won’t get a 20 minute version of Sasquatch. They go from rockin’ alt-country to slow and sweet and back again at least a handful of times throughout the night. They recently won the San Diego Music Award for Best Alt-Country. And in addition to being outstanding musicians they’re really wonderful people. Billy Shaddox (the lead singer and guitar player) was interviewed in the Union Tribune today. They’re by far one of the most fun bands in San Diego, you really should go check them out. This entry was posted in music, san diego and tagged alt-country, billy midnight, casbah, san diego music awards. Bookmark the permalink.